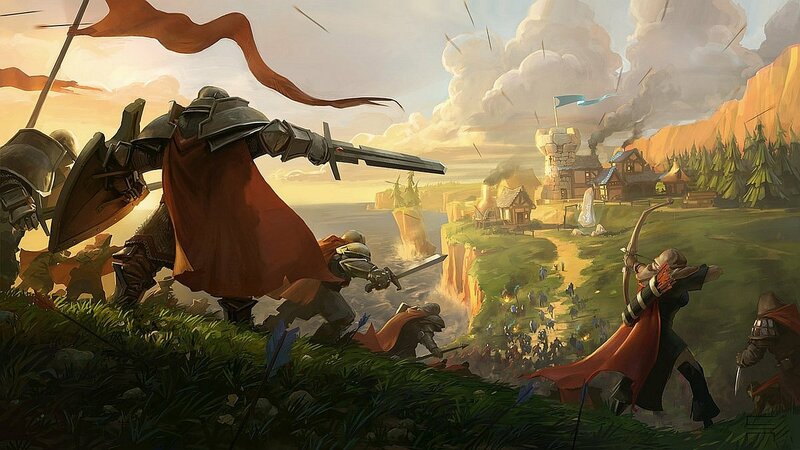 In Albion Online, the PvE is the only way to improve your stuff (having the ability to carry third parties higher), you will find different ways to do this PvE, each with its own "rules" and its own techniques. This guide will aim to awaken you to these different ways of perceiving the world of Albion. You will find 2 distinct types of dungeons in Albion, solos and multi. Each one is full of enemies of different factions, each one having its specificities in relation to the general classes (mages, distances, melee ...) Here is a list of the most common mobs that you will meet in each of the dungeons. • Druids: These are the healers, to focus first, because they are unable to heal themselves. • Large guards with shield: Capacity to stun. • Crossbowmen: These have the ability to do AOE triangle in front of them as well as to jump back and set a trap to their foot. • Mages: They invoke bats that will not hesitate to focus your healer first if no one is typing them. They are also able to invoke zones of damage to the ground. • Small skeletons: slow, but gain in speed little by little to avoid that the players can avoid them infinitely by turning in circles. • Ghouls: Improved version of the small skeletons, because just as low in HP, but much faster from the moment you approach them. • Swordsmen: Just a tank that will make AOE from time to time just in front of them with their sword. • Mages: They apply their pattern in a loop with 1 monocible spell causing damage with a slow enough on the target, AOE on the ground capable of destroying a complete backlane and an AOE around them exploding in a chain to force the taks To distance themselves. • Explosive skeletons: Very weak in HP, they will not hesitate at times to carry out a murderous AOE around them. It is advisable for the tanks to leave this kind of mob at the distance, knowing that a few moments after their death, their "soul" explodes in order to finish their work on the looters too fast. • Warriors with an ax: Once less than 33% of their HP they will perform a whirlwind while following their target in order to sow chaos in your group. • Warriors to the ax: DPS distance capable of slow then stun their target. • Small warriors: Like the squires of Morgana, they are only there to add small damage and targets to be felled. • Mages: They make 2 AOE, one static and the other mobile. Solo dungeons are the most commonly used dungeons in the beginning for those who discover the game. These dungeons are called "green" dungeons on the map. They are meant to be feasible, whatever your weapon solo, nevertheless you will have to be wary of the speed at which you can execute it. Some weapons will require a little more patience to regenerate between packs. You have to be careful that these dungeons are not instantiated, so you can follow someone who has already killed the mobs just before you arrive or someone might come and overtake you while you try to arrive Gently to the boss. Even more dangerous, if you go to an area where pvp is activated, you can always find yourself facing a group of people waiting for one thing: your arrival and your loots. This kind of dungeon is great, but you will have to find areas that are further from the cities, where few people have the courage to go in order to do your adventure. At the level of the rewards, this kind of dungeon is to be made only for money and fame. To make them to 2 can be very profitable, because although these two rewards are divided by two, it will be easier to chain the packs of mobs by exchanging the tank (if you are 2 dps) or then remaining each in Its role, but in this case it is advisable to have at least 1 base dps. The dungeons of groups, called "blue" are the most looped by the guilds in general ways. These dungeons are provided at the base for groups of about 5 players. It is advisable to have 1 heal and 1 tank in the group. These will bring you much fame and money, in addition to the essences that you can drop regularly to refine your enchanted resources. If you're lucky, you'll get pieces of stuff here and there. You will find the creatures to kill, for the leather first, present for all thirds (from 1 to 8). But you will have the opportunity to have, in each biome (except the deserts) of the elementals corresponding to the most important resource of the zone. These will only be present at third parties 3.5 and 7. These camps are located in all areas (outside the city) and are made up of a few mobs of the same faction defending a small chest full of money that you can drop. The Hell Gates are the only mixed instantiated content of the game (PvE / PvP). Indeed, you will have to kill a Boss on an openworld map that will create a portal at his death. You can only enter in groups of up to 5. Once inside you will have one of the sides of the Hellgate to perform before arriving at a central point of the map where you will be able to meet another group of 5 players having killed another identical Boss elsewhere in the vast world of Albion. This is where an intense PvP session starts to see who will have the right to continue and try to kill the final boss. Once you win this battle, you will have to continue on the side you prefer to pick up the boss on the top platform. The latter is quite dangerous if you do not react fast enough. He launches at regular intervals a large AOE around him pushing back all those who have not had time to depart and can very much lower the life of your tank. Between his blows he will throw small puddles of lava persistent for some time, in which it is better not to walk if you want to avoid the fury of your healer. More Albion Online news and guides we will post here in upalbion.com, you can keep eyes close in our site.